Guys… any recipe that includes the word “beer” is one the entire family is going to relish. Serve them for lunch, weekend football afternoons, patio parties and if you’re casually inclined, they’ll even perk up a wedding. Think: “grilled cheese sandwich goes to finishing school” – and expect legions of new fans beating a path to your kitchen and your hoard of Grace Baking Pretzel Buns. Sure, you could make these with sandwich bread… but do you really want friends and family to whisper behind your back? 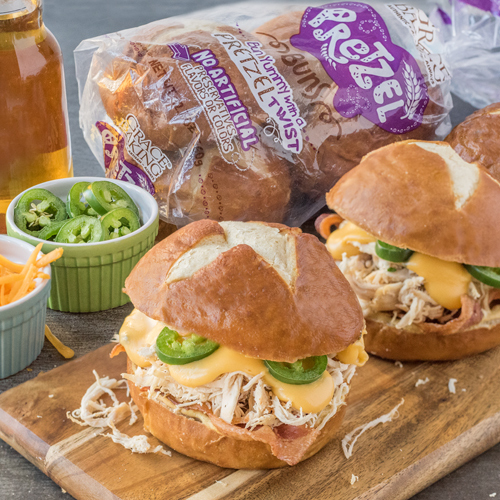 Live a little and splurge on plump chicken breasts, aged Cheddar, hickory-smoked bacon, fresh garlic and all on our better-than-the-rest Grace Baking Pretzel Buns! Imagine on scale of 1 to 10 how good these are. Now, double it. And then some. In a slow cooker, combine chicken, beer, garlic, salt and pepper. Cover and cook on high for 4 hours or until tender. Shred the chicken with a fork, set the cooker to low and cover until time to serve. Make the cheese sauce. Melt butter in a medium saucepan over medium heat. Add in flour and whisk for 2 minutes. Continue to whisk while pouring the beer and milk slowly into the sauce. Continue cooking and whisking until the sauce is smooth and thick (approximately 5 minutes). Turn heat to low and slowly add the cheese. Stir until cheese is melted. Stir chives into sauce and set aside. Preheat oven to 350ºF. Once warm, place pretzel buns in the oven to heat up (approximately 3-5 minutes). Remove from oven and spread mustard on the bottom half of each bun. Top each with 2 slices of bacon, chicken, beer cheese sauce and jalapeños. Top with pretzel bun lids and enjoy!